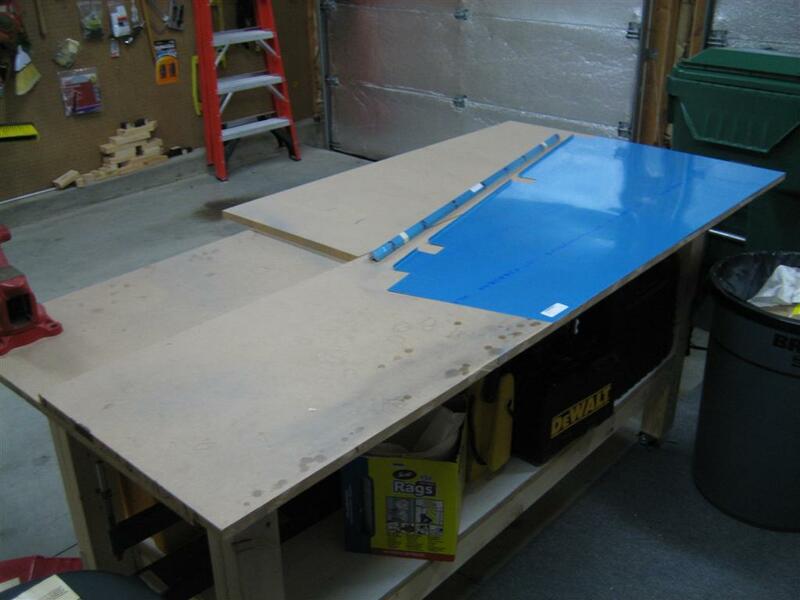 Well, with the vertical stabilizer safely in the airplane storage room, it’s time to get started on another part. Next up, the (infamous) rudder. There are a lot of steps on the rudder that give a lot of builders a lot of trouble. I am confident, but will continue to use other sites on a daily basis before doing any work that evening. That’s worked out well for me so far, so I’m going to keep at it. First thing’s first, the ceremonial plans change. 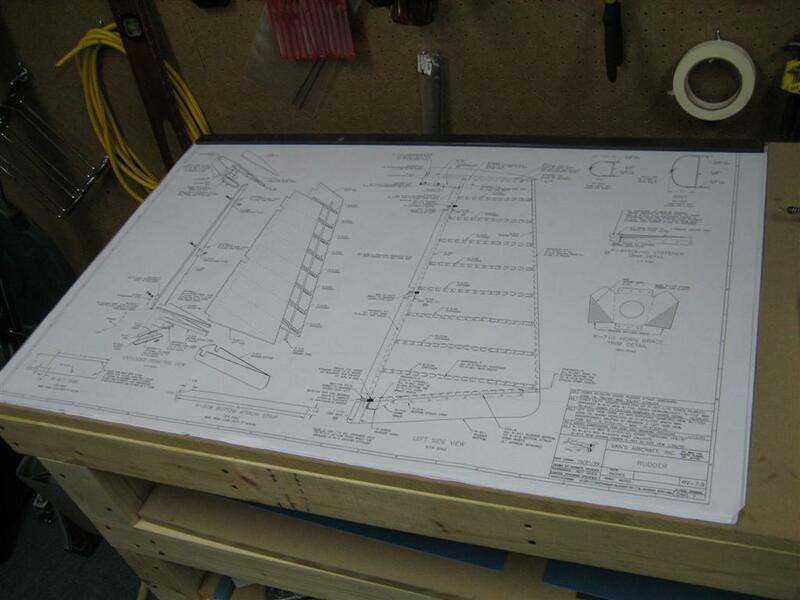 I still keep the plans on my second workbench. Maybe someday I’ll find a place to actually hang them up. I'll have to do one skin at a time. I don't want to get too crowded, and I am not overly concerned with building efficiency. 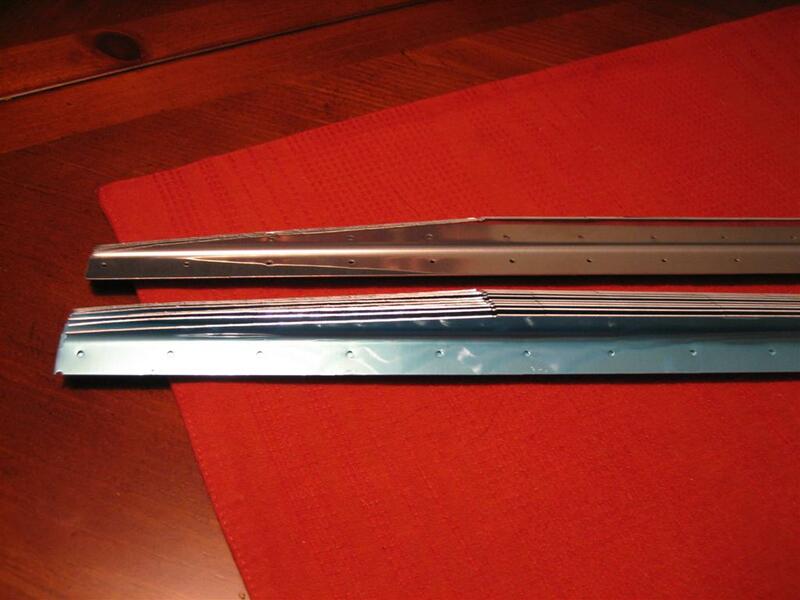 First step in the manual is to start on the stiffeners. I fished out the bundle of stiffeners (there are two bundles, one set for the rudder, and one set for the elevator) and studied the plans. For the back side of the stiffeners (with the shallow angle on the right side of the picture below), these are the final cuts, so I need to be careful. For the front side (you can see a little of the front of a stiffener on the left in this picture), only 2 of the 16 stiffeners will be to full length, so the other 14 can be rough cut until I can mark them to final size per the note at the tot of this picture. 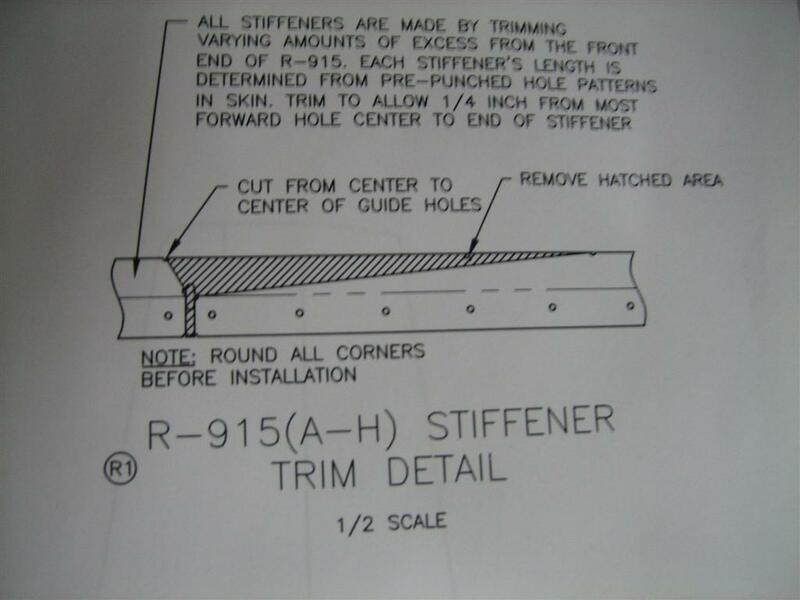 Stiffener Trim detail, drawing 7. 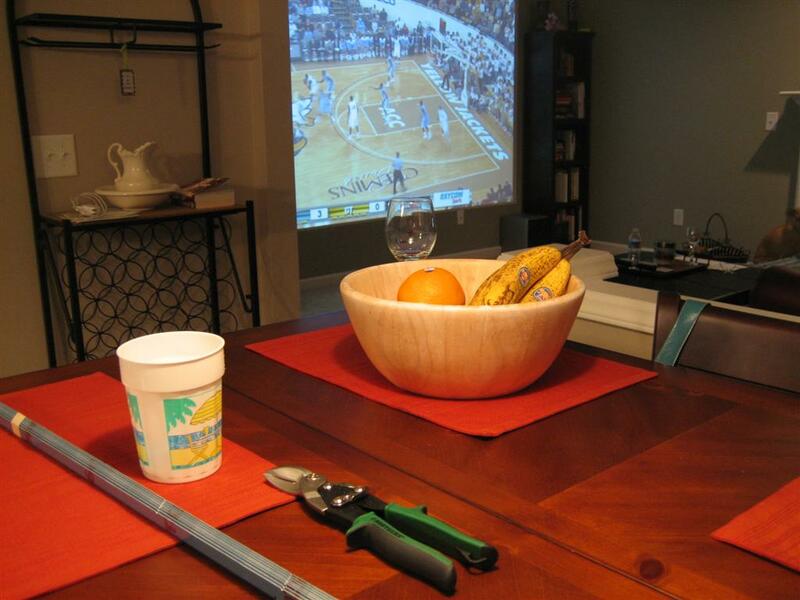 Next, I headed inside to sit myself down at the table so I could watch the UNC vs. GT game. I know some of you are panicking right now, but please calm yourselves. While it appears that my winerack is empty (OH MY GOD, NOOOOO! ), that is really our third winerack. Rest assured that our two primary wineracks are stocked satisfactorily. Is that an empty winerack? Don't worry, the hooch is stored in another rack. Anyway, here’s the stiffener bundle I’m about to break open. 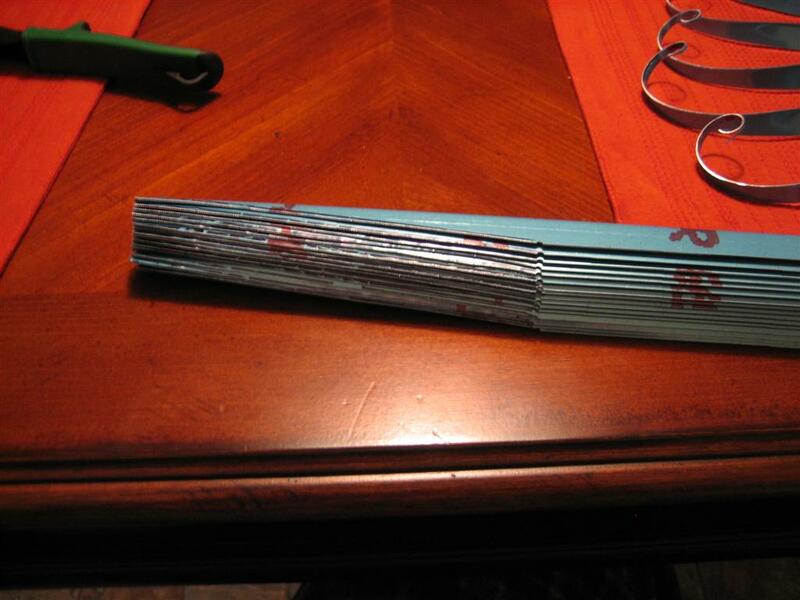 I broke open the bundle and started snipping from center hole to center hole. After a few stiffeners, I started biasing the cuts to the sides of the holes, but only where I was sure that I was going to have to remove more metal later. 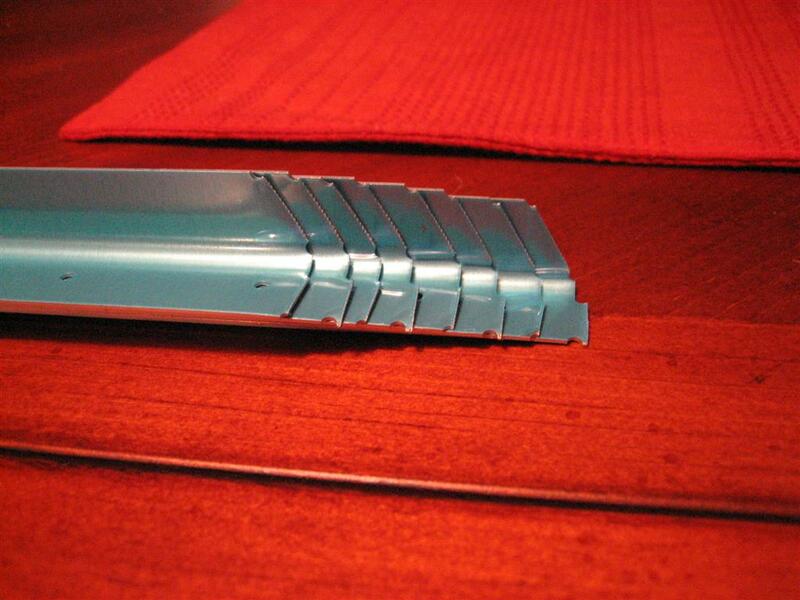 Here you can see that on the top part of the cut, I’m lined up with the left side of the slot. 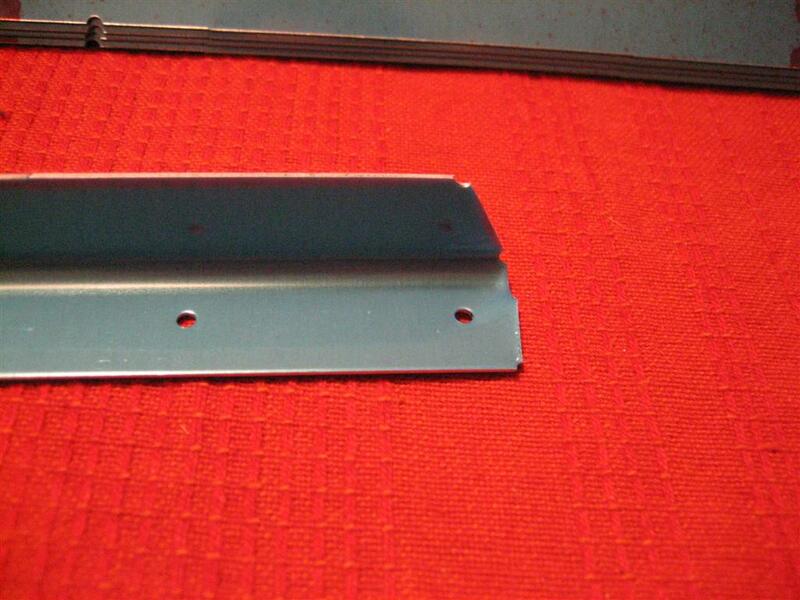 I included another picture of the angle cut for the front end of the stiffener. Remember, only two of these cuts are for real, as the next step is to chop off varying lengths of stiffener from the front to match up with the pre-drilled holes in the skin. Here’s a rough cut for the front end. 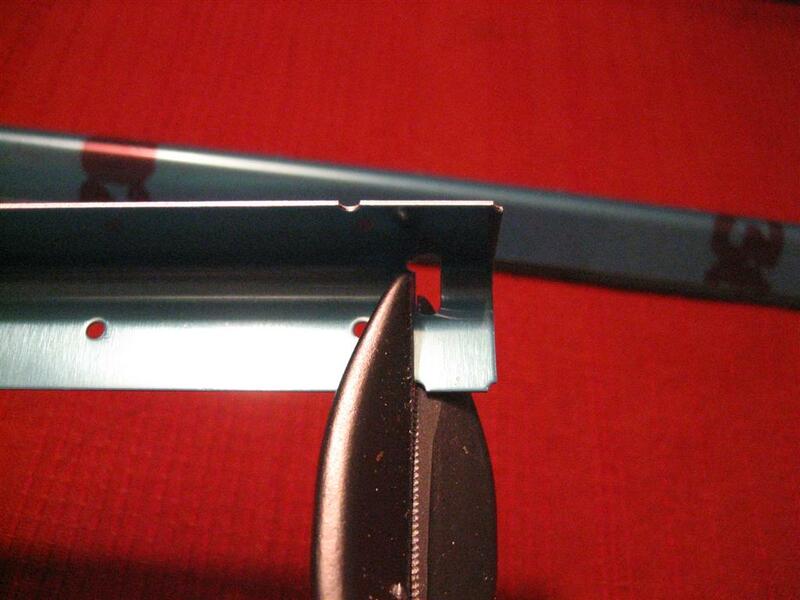 See how I am going to have to remove more metal because of the notches. Might as well get closer on the first cut. That’s why I started biasing the cuts to one side after the first few. 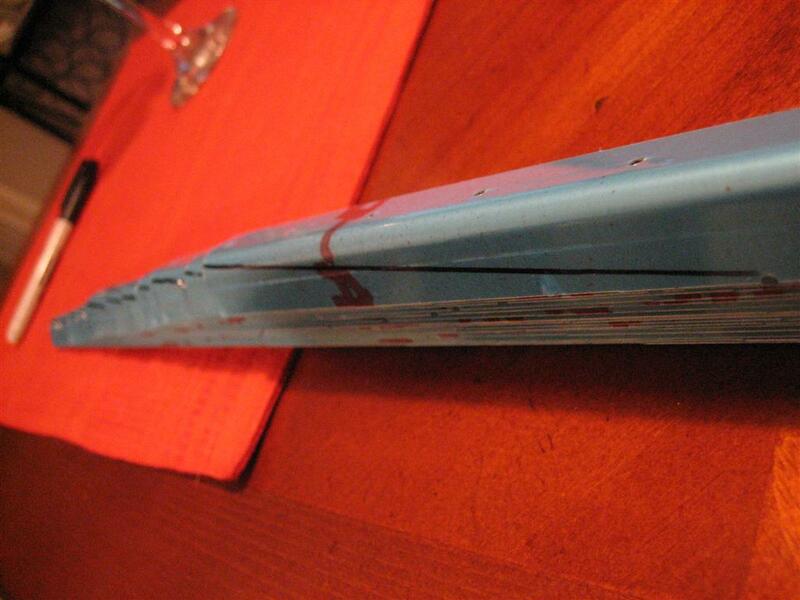 The front end of the first stiffener. First 8 front ends done. 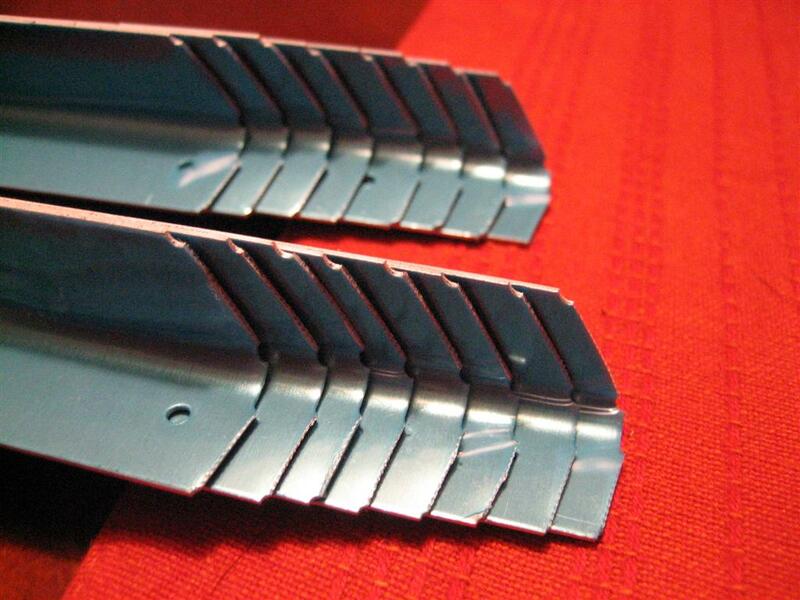 Yikes, those are going to need some edge finishing. 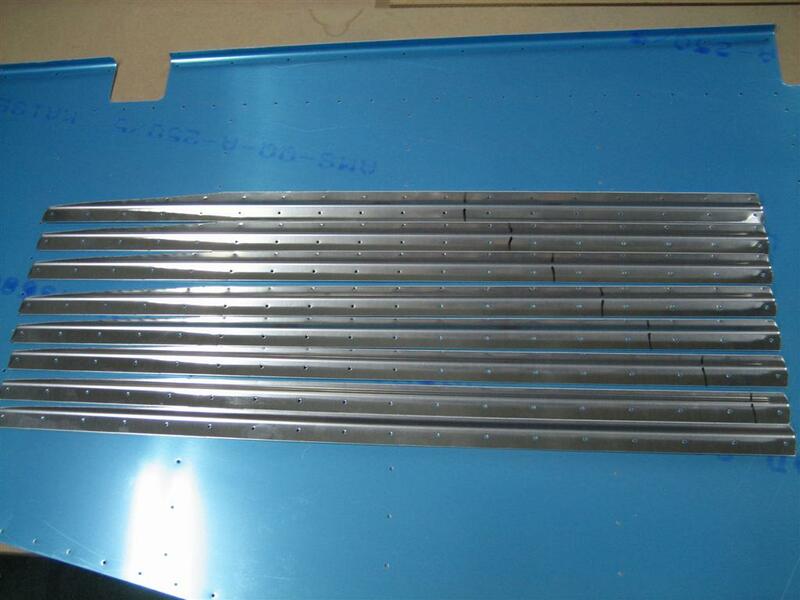 All 16 stiffeners’ front ends done. 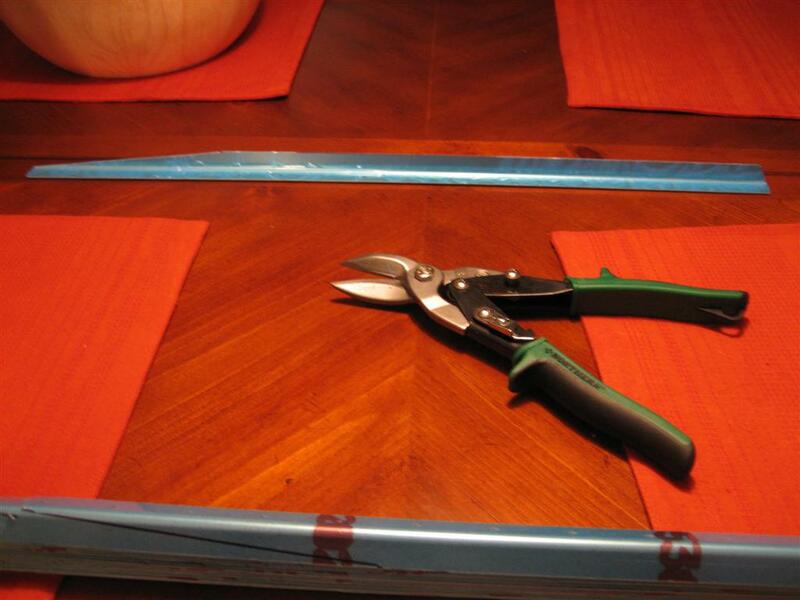 Next, I used an admittedly fat sharpie to draw the required cut lines on the aft ends of each of the stiffeners. Lines drawn, back to snipping. 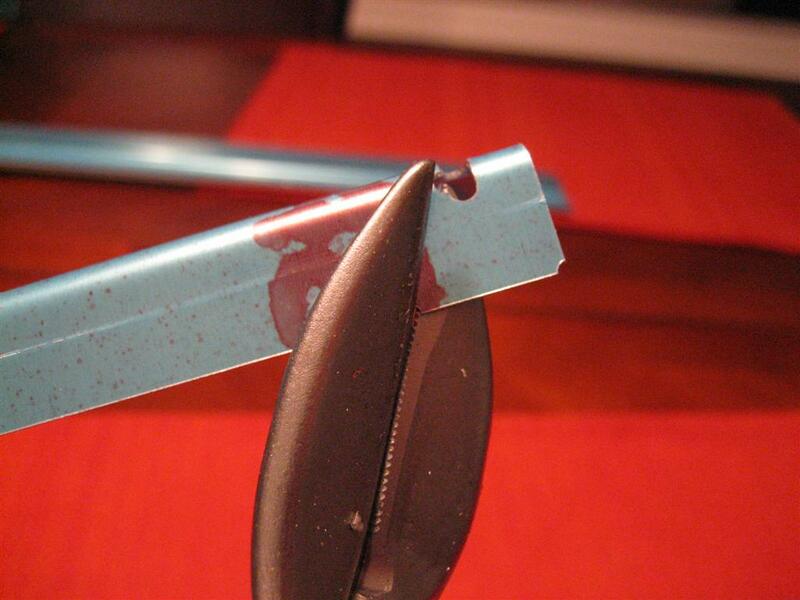 And here I am using the snips to cut that longer line. 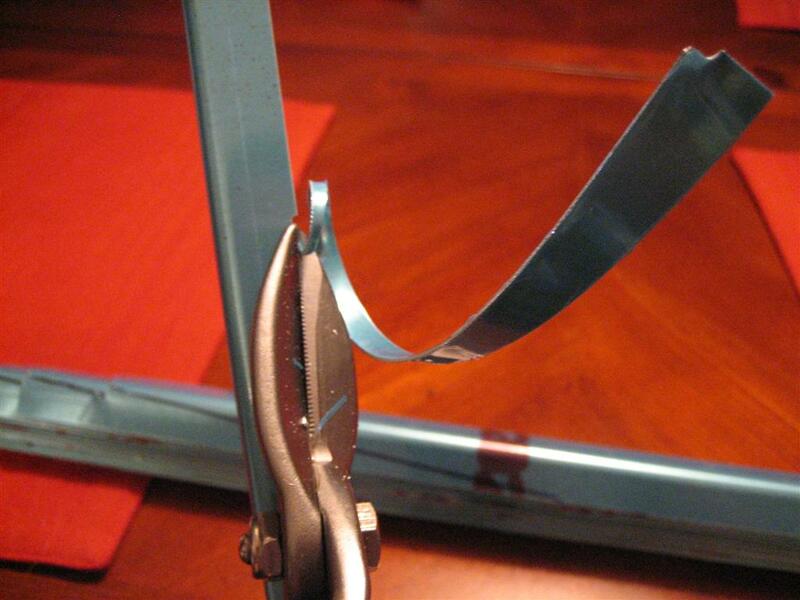 Snips aren’t perfect for this task, since they bend the metal, but if you work them correctly, they will only bend the piece you are cutting off. There is kind of a rocking motion you have to feel with each cut. You’ll get it when you try. Here’s the first one, done. I'm a little camera happy today, don't you think? Then, I finished up the other 15, and was left with these scraps. If I had even the slightest hint of an artistic bone in my body, I would make some comment about how these resulting spirals are king of cool. But I don’t, so I won’t. Scrap from the latest cuts. All 16, ready to be devinyled. This is going to take forever. I’m glad I did the devinyling inside. When the vinyl is warm, it comes right off. 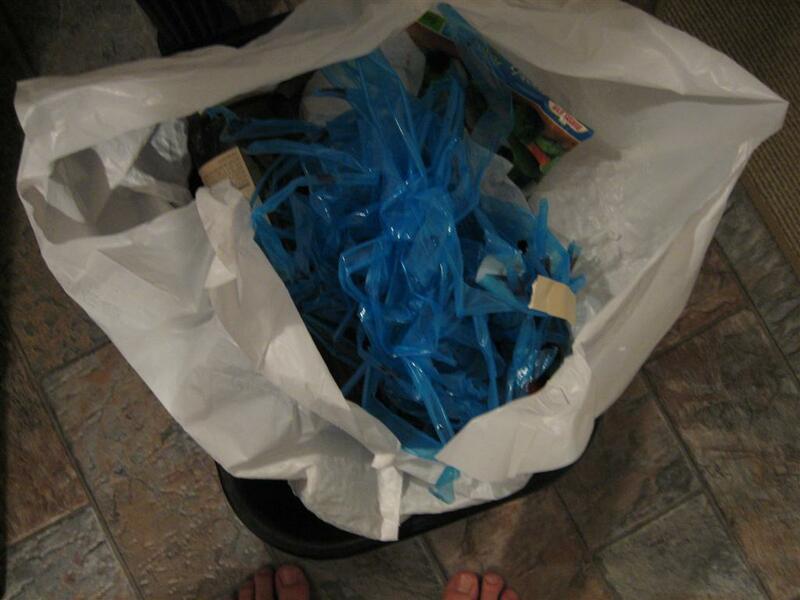 Holy crap that's a lot of blue v-......WHOSE TOES ARE THOSE AND HOW DID THEY GET IN THE PICTURE!? 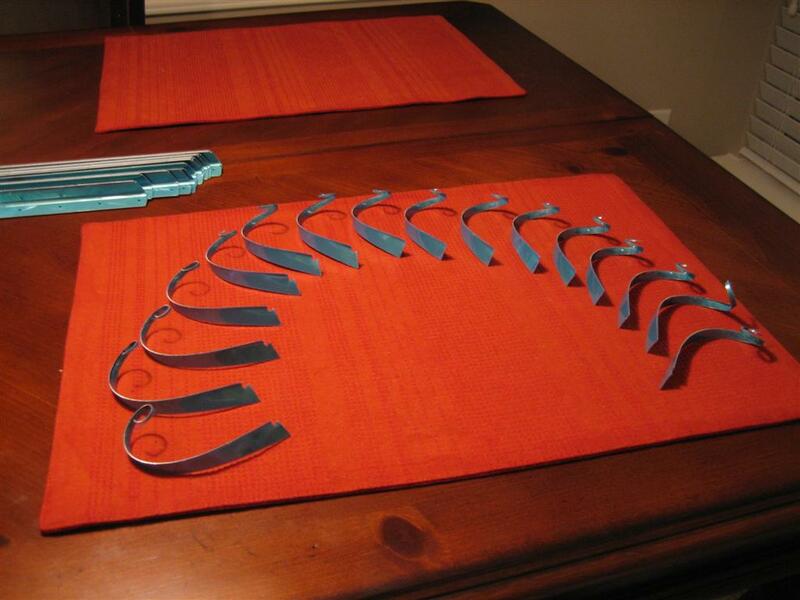 Next, I headed outside to put everything away, but couldn’t resist setting the stiffeners out on the skins. I'll need to trim some of these, don't you think? For now, I just drew a thick marker line along the front spar holes. If I cut along these lines, they will still be too long, but at least now I can figure out which hole will be the most forward hole and then use the plans-suggested 1/4″ measurement to draw a nicer cut line. 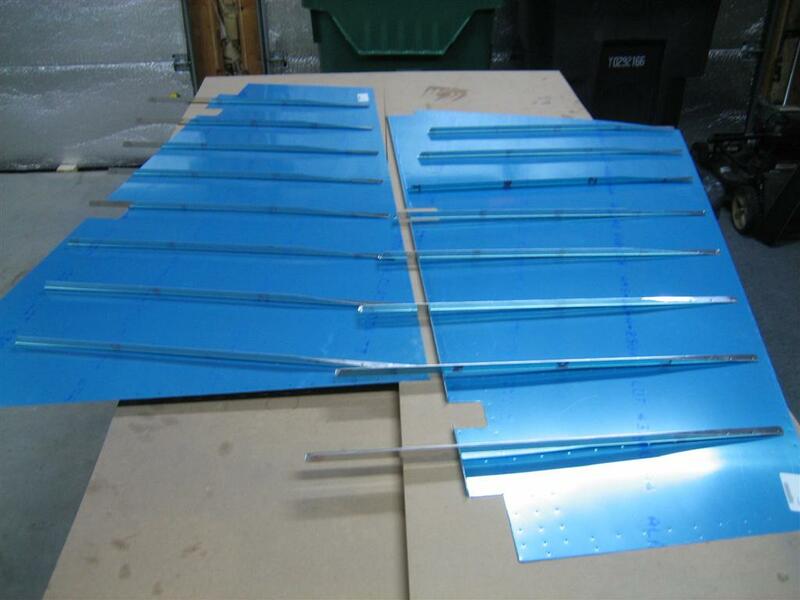 8 of the 16 stiffeners, ready for final cutting. One hour of camera-happy warm environment work tonight. Sorry about your bandwidth. 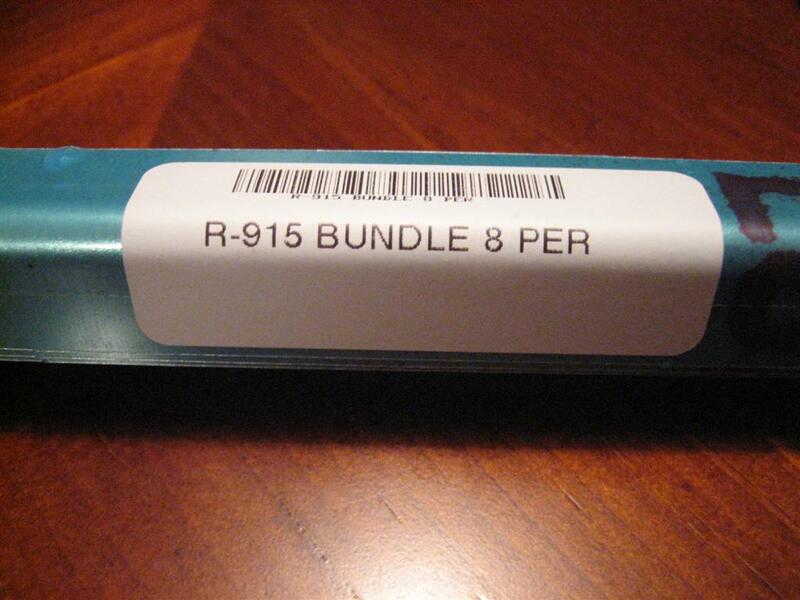 This entry was posted on Tuesday, February 16th, 2010 at 11:20 pm and is filed under Empennage. You can follow any responses to this entry through the RSS 2.0 feed. You can leave a response, or trackback from your own site.